Nicaragua’s Felix Alvarado is touted to be the most devastating puncher in the lightflyweight division today and he’s coming to town to face Davao City’s Randy Petalcorin for the vacant IBF 108-pound title. The fight is set at the Solaire Resort Hotel and Casino on Oct. 29 with the winner ascending the throne relinquished by South Africa’s Hekkie Budler. Alvarado, 29, is the IBF’s No. 1 contender and Petalcorin, No. 3. Under the IBF’s quirky rules, the No. 2 slot is vacant. 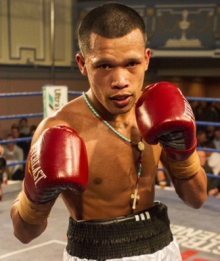 Alvarado will arrive in Manila on Monday while Petalcorin, 26, flies in from General Santos City, where he lives, on Wednesday. Alvarado is 5-4, an inch taller than Petalcorin, and enjoys a 4 1/2 inch reach advantage but more than his physical attributes, what makes the Nicaraguan a dangerous proposition is his bone-crushing power. He has scored 29 KOs in a slate of 33-2, a lofty 87.9 percent KO rate. Petalcorin's record is 29-2-1, with 22 KOs.